Larry Page's long-rumored "flying car" project is finally ready for takeoff. 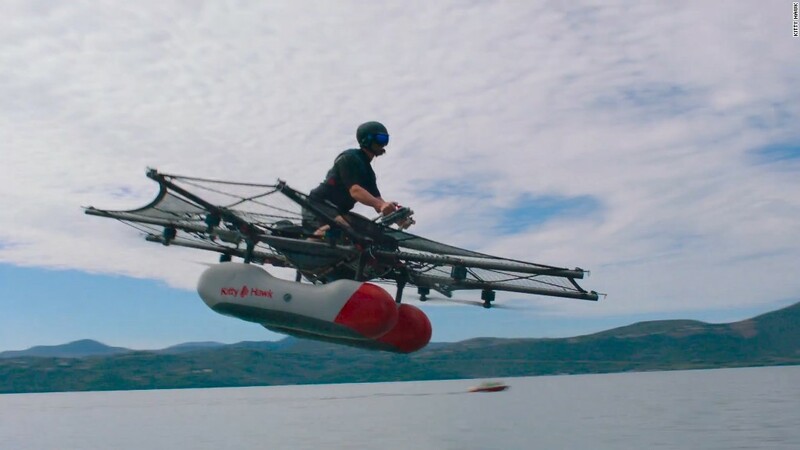 Kitty Hawk, a startup backed by the Google (GOOGL) cofounder, unveiled its prototype for an "ultralight" aircraft that can take off vertically -- as long as you're flying over open water. 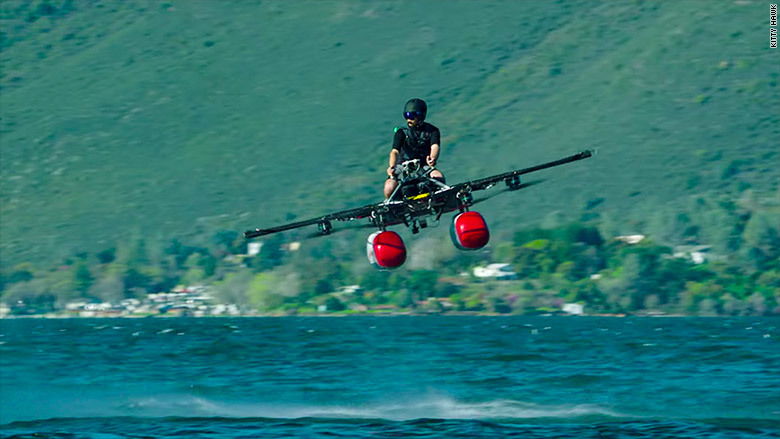 In a demonstration shared online Monday, the Kitty Hawk Flyer is shown lifting off over a lake with the help of small propellers under its base. The prototype looks less like a car than a jet ski with wings. The Flyer is expected to go on sale by the end of this year, according to the company's website. The price has yet to be announced. The startup says it has received approval from the Federal Aviation Administration for the aircraft to be flown in "uncongested areas." Customers will not need a pilot's license to use it. "We've all had dreams of flying effortlessly. I'm excited that one day very soon I'll be able to climb onto my Kitty Hawk Flyer for a quick and easy personal flight," Page said in a statement provided to The New York Times, which was first to report the news. Nearly a year ago, Page was reported to have invested more than $100 million in flying car startups. Reps for the company did not immediately respond to a request for comment. Sebastian Thrun, CEO of Kitty Hawk and a former Google exec who led the company's self-driving car efforts, described the mission on Twitter as nothing short of "changing the future of personal transportation." If the Kitty Hawk prototype doesn't exactly look like the flying car of your sci-fi fantasies, you're probably not alone. Several firms, including Aeromobil and Terrafugia, are developing flying cars that look more like tiny planes than cars. Many rely on vertical takeoff and landing, or VTOL, eliminating the need for a runway. The Kitty Hawk announcement also gets out of in front of Uber, which is scheduled to hold an event Tuesday related to its own flying car efforts. Page's Google has a complicated relationship with Uber. Google is an investor in the ride-hailing startup, but Google's self-driving car unit is currently suing Uber for allegedly stealing its intellectual property.